On 10 August 2012 South Korean President Lee Myung-bak visited a set of disputed islets - called Dokdo in Korea and Takeshima in Japan - in the sea between Japan and Korea, causing a diplomatic rift between the two nations. Lee Myung-bak was the first South Korean leader to visit the rocky outcrops. The islets have been at the center of a dispute between the two nations since the end of Japan’s colonization of the Korean peninsula in 1945. In Seoul, Lee’s ruling party applauded his visit to the rocks, calling it a meaningful move to defend South Korea’s territory. The main opposition party responded by declaring that the trip was just a publicity stunt and was aimed at deflecting criticism of Lee’s administration. Japanese Foreign Minister Koichiro Gemba questioned why President Lee had to make the trip now and called it utterly unacceptable, and said Tokyo had temporarily recalled its ambassador in South Korea in protest. Foreign Minister Gemba says Japan will consider taking legal action at the International Court of Justice over disputed islands in the Sea of Japan. In 1954 and 1962, South Korea rejected Japan's proposal that the two countries refer the territorial issue to the international court. Legal procedures at the International Court of Justice do not start until both sides of the dispute agree to seek litigation. A high ranking South Korean official said the country will reject any move by Japan to take a territorial dispute between the 2 countries to the international court. The long-standing dispute with Japan concerns which nation exercises sovereignty over the group of tiny islands located off the east coast of South Korea. 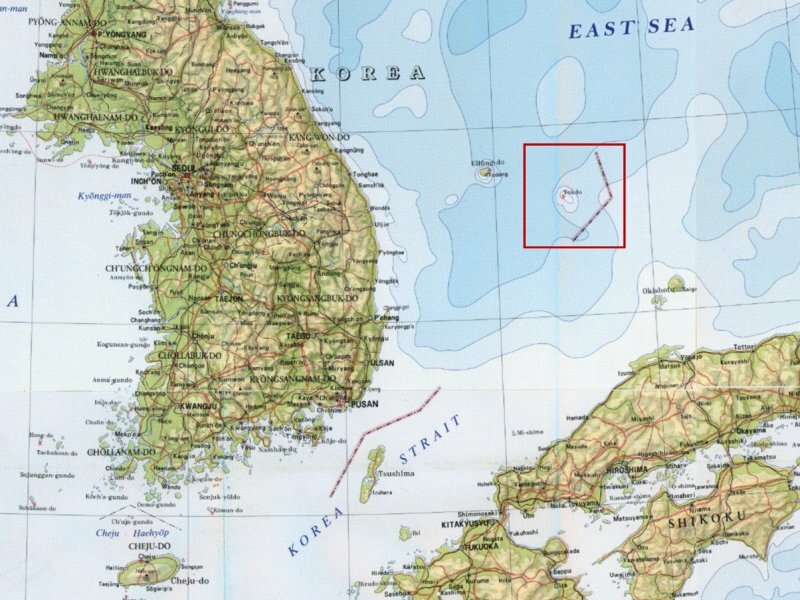 The South Korean government refers to these islands as Tokto (Lonely Islands in Korean), but other sources refer to them variously as the Liancourt Rocks, the Hornet Rocks, or Takeshima (Bamboo Island in Japanese). The Liancourt Rocks in the southern part of the East Sea (otherwise the Sea of Japan). Territorial disputes between Japan and China (Senkakus/Diaoyutai), between Japan and Korea (Takeshima/Tokdo), and between Japan and Russia (Southern Kuriles/Northern Territories) are the nub of extant regional security concerns. US policy on the Dokdo/Takeshima Island issue has been and continues to be that the United States does not take a position on either Korea's claim or Japan's claim to the island. 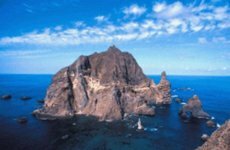 Dokdo, a group of tiny, rocky and hard-to-inhabit islets, is located some 87 kilometers east of South Korea's Ullung Island and 157 kilometers northwest of Oki, Japan's westernmost island. Dokdo (also known as "Liancourt Rocks" or "Takeshima") consists of 34 islands created by volcanic activity. 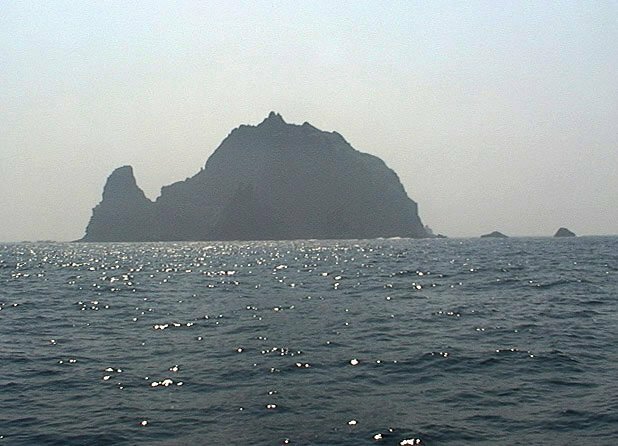 Dokdo is located 87.4km south-east to Uleungdo, 255.9km away from Pohang, and 157.5km away from the Japanese island Oki. The latitude of Dokdo is between 131°52'22" north and its longitude is between 37°14'24" east. Occupied by South Korea since 1954, as of 2012 it was uninhabited except for a South Korean Coast Guard outpost and an elderly couple. In Korea, Dokdo was called 'Usando', 'Hajido' and 'Sambongdo', and it is in the report of the governor of Ulleung-gun in 1906 where we can see Dokdo was called 'Dokdo'. In Japan, it was in the 17th century that the name "Dokdo" appeared; at that time Ulleungdo was called 'Jukdo' and Dokdo was called 'Songdo'. In modern times, the name "Songdo" disappeared, instead "Jukdo", which was originally the name for Ulleungdo, became the name for "Dokdo". The name 'Dokdo' appears for the first time in the Report of Sim Heungtak, the governor of Ulleung-gun in 1906. It is sometimes called "Dokdo" or "Tokdo" under different romanization standards. In 1849 French whale-hunters gave the name of their ship -- Liancourt -- to the islets. There has also been a dispute over the name of the sea rich in fishing grounds where Dokdo lies. Korea insists it should be called "Donghae," or East Sea in English, while Japan claims it should be "Sea of Japan." Japanese influence in East Asia began to rise rapidly in the 19th century. In 1905, Dokdo was the first part of Korean territory to be annexed by Japan, and in 1910, Japan annexed all of Korea. The Japanese colonizers instituted an official policy to suppress Korean culture, the cornerstone of which was to forcibly stamp out Koran language. This extended to changing the Korean names to Japanese, as well as converting local geographical names of Japanese. The use of Dokdo as a live bombing range took place during the US military occupation of Japan and southern Korea after the end of the Pacific War, from 1947 to 1952. During the rule of Syngman Rhee, South Korean navy vessels were dispatched to chase away Japanese intruders on the island. Since 1954, South Korea's Coast Guard has been stationed there as a symbol of the nation's ownership. Since July 1954 to the present, the Republic of Korea has stationed a number of security guards on Takeshima, the scale of which has continued to increase year by year, including lodgings, a lighthouse, a monitoring facility and antenna. In November 1997, despite repeated protests by Japan, a docking facility to enable use by a 500t supply ship was completed. In December 1998, a manned lighthouse was completed. The year of 2005 was intended to be a year of friendship between Koreans and Japanese as the year marks the 50th anniversary of the conclusion of World War II, as well as the 40th anniversary of diplomatic normalization of the two countries. The Shimane Prefectural Assembly's passed an ordinance designating Feb. 22 as "Takeshima Day" to reiterate Japan's territorial claim to the Takeshima islands. This aroused strong protests in Seoul and soured otherwise good bilateral relations. Japan's renewed claim to Dokdo follows the discovery of large hydrocarbon deposits around the island, and to the rising nationalism in Japan. In 2004 a 10-year, $225-million gas exploration project was started southwest of Dokdo by Korea Gas, a state company. Korea National Oil and Woodside Petroleum of Australia started oil and gas exploration in the summer of 2005 north of Dokdo. Laying claim to Korean islets of Dokdo is the latest evidence of the trend among vocal nationalist organizations in Japan. The number of nationalist bodies engaged in loudly propagandizing the greatness of the old empire and the heroic soldiers of the Emperor's troops is increasing. The approval by the Japanese education ministry of eight history textbooks for middle school students further exacerbated the anti-Japanese protests on the streets of Seoul and other parts of Korea. Some textbooks take positions that play down the colonial past of Japan. Japanese textbooks describe history without mentioning the war crimes Japan perpetrated. A mass movement to expose pro-Japanese Koreans has emerged in South Korea, and Japan's claim to the island has fueled this movement. President Roh Moo-hyun's progressives largely support the exposure initiative, while members of the conservative Grand National Party do not. Korean nationalists maintain that Japan's insistence on Dokdo dominion is just the extension of the trial to take away Dokdo for militaristic purpose in February 1905 after the Japanese Imperialist's Russo-Japanese War. They contend that Japan's diplomacy with Korea is an extension of the old Japanese Imperialism. Korean nationalist assert that the Dokdo problem is not merely a dominion problem, but is become a national problem. They seek to maintain the sovereignty of Dokdo and of South Korea by actively reacting to what they regard as Japan's new imperialistic diplomacy. The ROK government issued a strong protest against Tokyo 08 March 2005 after South Korean military jets made a sortie to the skies over the Dokdo islets to send away a Japanese civilian plane trying to fly over the area without permission. 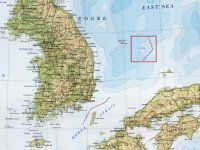 The airplane attempted to enter the Korean Air Defense Identification Zone (KADIZ) over Dokdo, South Korea's easternmost islets in the East Sea. The Air Force dispatched four fighter jets to warn the aircraft, owned by the Asahi Shimbun, a leading Japanese daily. Around 8:21 a.m., an airplane unilaterally notified the Air Control Center (ACC) in Incheon of its plan to enter the zone. `t returned to Japan as the South Korean authorities disallowed it. The reason for the plane's flight was not immediately known, but officials believe it was to take photographs of the Dokdo islets. A pair of Japanese Coast Guard vessels departed Tokyo on 18 April 2006 to conduct hydrographic surveys near the disputed islands. South Korea's government said it would take "stern" measures should Japan carry out the survey. "If the Japanese government pushes ahead with the survey, we will deal with it sternly according to the relevant international and local laws," South Korea's Minister of Foreign Affairs and Trade Ban Ki Moon said after meeting with President Roh Moo Hyun. Japan's chief government spokesman said the country is following international law.